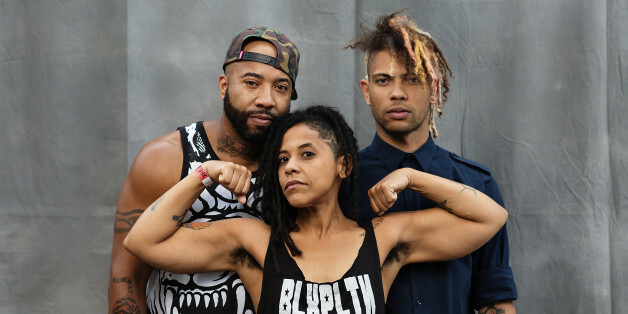 In late August of 2014, we flew from Austin, Texas, to Brooklyn, New York, for AFROPUNK Fest, an annual festival of all things Black and punk. A light drizzle accompanied us onto a stage that has hosted legends and icons. There was something other than mere precipitation in the air, however; a palpable heaviness hovered that everyone felt. It was as though, despite the apparent tranquility, something could rupture at any second. It was only 15 days prior that Mike Brown's body was left for three and a half hours in the street as onlookers gaped and the media exploded, and here we were performing songs about police brutality. As people raised their hands and sang along, it struck us that our band, BLXPLTN, was now very much tied to a rising movement. We can't speak for the whole of Black musicians, but we can speak from our experience within the context of a very unique space as a black and brown queer punk band. We know the power of song is undeniable, and within that space we can convey ideas and feelings that are just too hard to speak or even write about. Our wounds run so deep they can render us speechless, but never voiceless. We can't say how we're feeling at the moment, but we can scream it. #BlackLivesMatter was started by a group of black queer women following the Trayvon Martin verdict. Black queer voices across the gender spectrum are the fastest to be silenced, drowned out and stomped down. Our own Khattie, who plays guitar in BLXPLTN, has fought her whole career to be heard in the male-dominated music industry. This makes the momentum gained by this movement all the more uniquely remarkable. We feel that all oppressed peoples can and should stand behind the banner of #BlackLivesMatter. When black people are free, we are all free. It is a continuation of work that has been done in this country for hundreds of years. This is just what it looks like for us. Every generation has had its defining political protests, social movements, heroes, martyrs and musicians. Someone must always beat the drum. The funny thing is, BLXPLTN didn't come together to write protest songs. We are all very different people who needed a cathartic respite from the day to day; we needed to talk and write about what weighed upon our minds, blow off some steam and vent in a safe space. For us, that safe space was a very loud living room. What kind of world do we live in when simply existing is an act of protest? When speaking your truth is an act of rebellion? When sharing your experiences is an act of insurgency? When we recorded, "Stop and Frisk," a song about the infamous racist policing policy in New York City, we caught the ear of the national underground. We gave interviews about the racist practices of police in Austin. Things began to galvanize around us in a way we hadn't anticipated, and people began to write us sharing their own stories of struggle. Black music has always been raw. It is powerful, vibrant and innovative. Historically speaking, it has also been protest music. Rebel music. And time after time, White performers have slid in, co-opted the style, and sucked all of the culture and dignity and power from the original style. That's not to say there aren't incredible White performers; we're just speaking historically. Black youth have been demonized to no end. Popular music, sports, and Hollywood have all been weaponized against us. Black kids have this refuse served to them on a steaming hot platter daily. "You are trash, filth, a criminal by birthright. The best you can hope for is to be a sports star or a rapper, if you can live long enough." As Biggie said, "Either you're slinging crack rock, or you got a wicked jump shot." If mass media and the justice system are the weapon, then BLXPLTN sees ourselves and other rebel artists as the counterstrike. We need no permission. The battle cries of our brothers and sisters running alongside us in the charge are our validation. Music gives you the freedom to pose questions you couldn't otherwise. How many Nigerian lives are worth one French life, in terms of media coverage? How many Muslim lives? We live in a global community while our western "media" is consistently pitting people against one another. Poor whites are taught to focus their frustrations on poor blacks, when it is a system built by rich White men that keeps them in captivity. We are taught to focus on the person in the next cell, not the one who has the keys. We shouldn't even have to say "Black Lives Matter." We should be laughing with our loved ones, enjoying growing older and planning the future (which we definitely still find time to do). For the present, we'll keep on screaming and fighting and raising awareness and hell just as long as we have breath in our lungs.